Kangaroos are in Australia, this spectacular plant comes from New Zealand. So who knows why the name? Kiwi Apple should have been its name. This plant joins a long list of plants from “Down Under” that is sold at Vale’s Greenhouse. 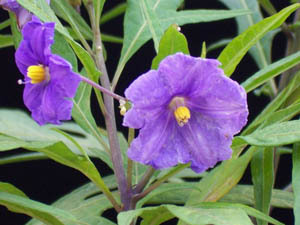 Kangaroo Apple, has beautiful large lance like lobed leaves, with showy purple flowers two inches or so across. An interesting note about this plant is the flowers are hermaphrodite, which means the flowers have both male and female organs, thus they need no cross-pollinating. These flowers are followed by small, orange, egg-shaped fruits which were used to make jam by the early settlers in its native New Zealand. 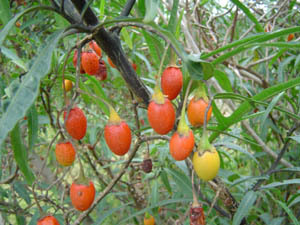 Only pick fully ripe fruit or fruit that has fallen off the plant otherwise it is bitter. This tough plant grows about 5 feet tall takes hurricane-like winds and love the hot. Be warned it has a passion for water and will become limp if not checked daily for watering, it will recover quickly once it has had a good drink. This wonderful plant can easily be mixed into the big container for a dramatic effect. The genus Dianthus contains about 300 species, but only a rather small number warrant the attention from the home gardener. Eye catching and showy are not the only words to describe this Dianthus. 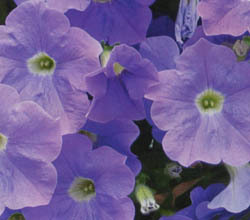 We also add words like tough, frost hardy, drought tolerant, makes a great cut flower and attracts butterflies. This compact plant only grows about 10 inches tall, loves a hot locations, and sure packs a punch in colour with eye-catching blooms which show a unique mixture of solid cherry, lavender with cherry centres and “tie-dyed”lavender and cherry pattern. 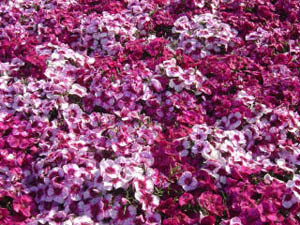 Corona Cherry Magic Dianthus would prefer to grow in the garden bed. It can be place in the front of the border with taller annuals behind. It can also be mixed into the perennial border to give that extra colour boost. This tough plant can also grow in the hard to grow places that can be too hot and dry for many other annuals. A good growing tip in the Calgary area, would be not to pull the plants out in the fall as often they are winter hardy and burst back to life the following year, making this plant a truly special plant. This beautiful plant goes by many names, Chupa chupa, Chupa-poto, Chilean Glory Flower, Scabor Vine or Tresco Gold Vine, and is a elegant, easily grown, tendril climbing vine. This plant will confidently cover a 4’x 5’ trellis and then stops right there without becoming a menace! Yup! You’ll be so happy with its bloom! 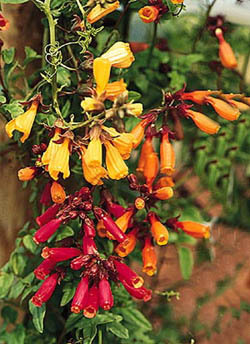 Sprays of many waxy, tubular flowers, that start off as light yellow then fade to rich orange, giving the effect of gold & orange coloured flowers, held on by contrasty wine-red stems, with very attractive dark green, fern-like foliage. Thrives in A.M. sun to bright shade, hummingbirds adore it! Best planted in hanging baskets and planters. This is a very unusual plant and demands attention. This outstanding annual deserves its popularity. It makes an architectural statement with slender, willowy stems that gives the plant an airy look, however it can be put in the foreground of a border despite its height. It then branches out widely near the top where rich lilac-purple flower cluster stand alone as if they are floating. Even though this plant stands about 4 feet tall it never needs staking, is very drought tolerant, and its showy flowers appear all summer long, until the first frost of autumn. A native to Brazil and Argentina it loves to be planted in a hot dry spot. The airy, see-through habit of Purple Top Verbena makes it a good choice for the front or middle of a mixed border. It doesn't cast much of a shadow and you can see other plants behind and under it. 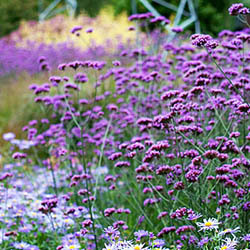 Weave a line of Purple Top Verbena through a bed or border of other butterfly attracting flowers. Best planted in columns or masses because it is so thin it will be overlooked all by itself. Here at Vales Greenhouse we have used this plant many times mixed into a border of annual Rudbeckia for a truly stunning look. Before you get excited about fresh sqeezed lemon juice, it does not give you lemons, it has lemon yellow foliage, and when crushed it gives off a fresh scent of citrus. “Ah! Back to the store.” This intresting basket stuffer gives an unsuual effect of a yellow evergreen foliage. Mixed into either a sunny container, where the yellow foilage intestifies in colour, or planted in part shade, this pretty, amazing plant will be the highlight of the pot. Dense thick foliage provides a contrasting backdrop to its container mates. Mixed grass to yellow petunias, bright gazanias, or a cool shade loving hosta. No matter what you plant you will be very happy with the outcome. Here at Vales Greenhouse we sell several different sizes of Lemon Cypress so you can plant it in the small to the large container. We always recommend that you place the pot where you can rub the foliage to release the fresh scent.